Long ago, man domesticated and trained horses for both work and pleasure. Although in time, their use in today’s economy has been diminished by machines, we still have the pleasure of viewing their grace and beauty in various sports. Along with their powerful size and fluid movement, one can’t help but be drawn in by their soul-searching eyes. With that kind of compelling ‘bait’, this year I eagerly attended three different horse events: Jumping (Saugerties, NY), Polo (Brandywine, PA), Racing (Wilmington, DE). First up, horse jumping…. I have never before been exposed to the immense size of these horses. The grace and power of being able to lift their weight and also a rider, seemed effortless. In order to prepare shooting the actual event, I used the warm up ring to time and find the right angles. The light in the competition ring was overhead and very challenging, as was finding the right position to try and keep out background clutter. The movement from one jump to the other was like anticipating a quiet storm. The approach was slow and calm but then a blast of power was emitted only to ease back into a methodical trot. 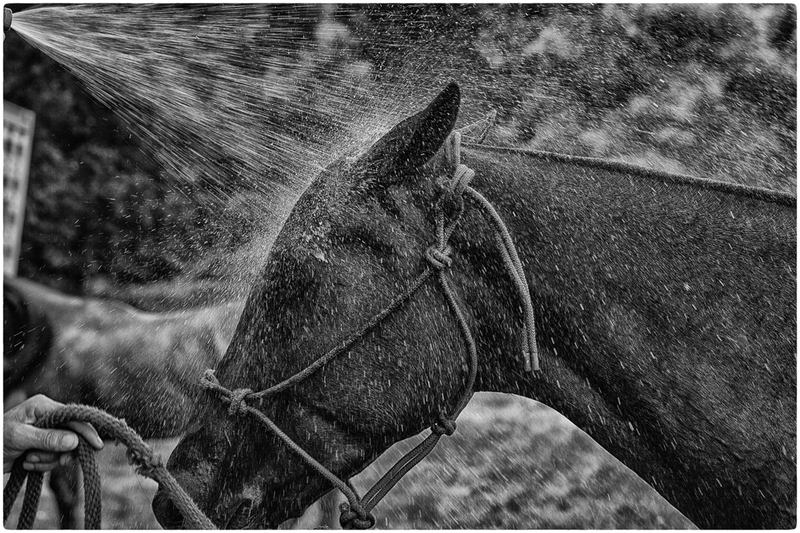 Next up the sport of Polo… not knowing the sport was the first hurdle, but the hardest was yet to come. I set out to find an engaging spectator, one whom I could ask questions. The questions just spilled out from this rookie… how do they score, which way does each team go, are their time limits etc? All were answered with a great sense of knowledge and pride by a duo I had accosted who were also proud parents to two of the riders. I found out the teams came from all over, even as far as Argentina, and when in the US they play in a circuit that takes them from the east to the west coast. My quest began when I tried to find the right combination of action and develop a personal connection. The easy part was the side to side, back and forth movement of the teams. The hard part, as usual in team sports, is to isolate the subject to get a unique connection with the sport and its participants. Last, but not least was horse racing… not a betting man myself, I was befriended by one who does on a regular basis. I found out about the weight of jockeys and how it plays a part in what the horse carries. The horses also raced on dirt and an inside grass course. Getting a shot of the inside of the track took a lot of ‘up, down and under’ rail maneuvering. The riders, owners and horses seemed to have a connection when racing but when finished, I did not find a loving relationship or bond like in the previous venues. I believe this was in part due to the money being spent and the very high-strung nature of the horses. This was evident especially when they finished a race, as many horses just wanted to keep going. Timing was key to almost all shots here, as you would place yourself in one position for each race and compose frantically as they blew by. An intimate connection to the horses was not achieved in these outings as I originally thought would happen. I believe this had to do with each being a viewer’s sport while the deeper connection would exist with the people who raised and trained them. For me this heart-felt, soul-searching event would have to happen at a later time when my interaction with these noble animals would not just be play but on a more personal level. As I viewed my pictures, the competitive-nature of this magnificent animal is apparent, but if you look more closely… you can get the feeling he is just ‘horsing around’ with us. I had planned on going back to this place for what seemed like a very long time. It is a place that I shared with my late wife and everyone in my family. For me it was -not just a place, but to others it was Ricketts Glenn. How do you shoot a place that is wrapped up with so much emotional history. It took me a year to even pick up my camera because the viewfinder has a way of isolating and intensifying what we see through its lens, and what I saw were images of a lost life. I came upon an ad from the Adirondack Photo Institute, giving a two-day workshop there. 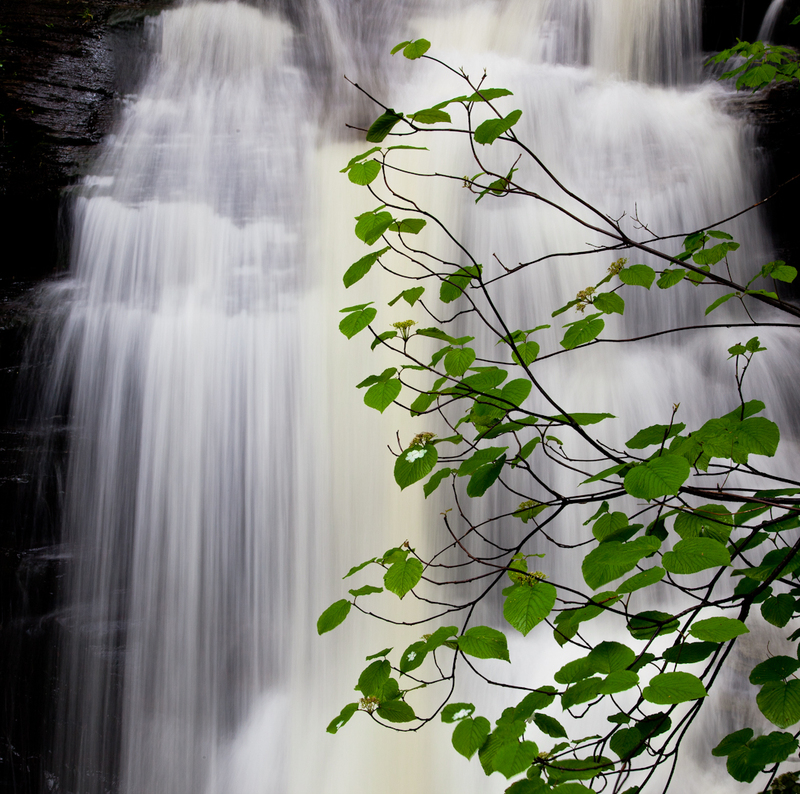 I had never shot this beautiful gorge with it’s all encompassing waterfalls from a photographers viewpoint. So with these thoughts, emotions and undying visuals I met our group leaders Mark Bowie and Joe LeFeve. They were two of the most visually attached to a place people I had met in a while. I took it slow and separated from our group as I did not know what emotion would come over me. Pictures started to appear all around me but to my surprise not the sadness or depression from the past. As the day progressed I interacted more with our group. I was pulled in by what they saw and felt. We talked and shot as we made our way down through the Glenn. Exhausted both mentally and especially physically our day ended with dinner when we sat down and shared our experiences. Remember to find your place, visit it often and share that experience. It is one thing I have found that can not be taken from you.